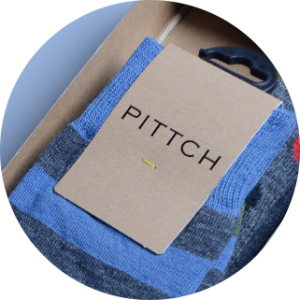 PITTCH are a new brand of luxury, vibrant and distinctive socks. Working alongside a Derby based design agency, we created a complete line of complimentary stationery and packaging that would showcase this exciting product. 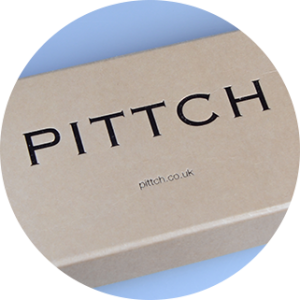 Working through the many print and packaging options with PITTCH, we decided upon a brown, kraft-type stitched box which would be used as the foundation for the design work. To achieve a unique end finish, we scanned the original sample in and adjusted the artwork until a match was found. During the press process, the colour was monitored until we were certain that the suite of products would all be perfect. The end result included sock header cards, presentation pillow packs, postcards and business cards all printed in litho and foil blocked to provide a distinctive, luxurious feel to the new branding style. We also supplied canary yellow tissue and foiled size stickers, on clear S/A vinyl, to complete the packaging and to match the vibrant yellow yarn PITTCH use to attach the socks to the new headers.